For the season, but mostly for safety. Why not put colored lights on your bike where people will see them? Who would see a Christmas tree in your apartment? Then leave the lights on till Spring, like the city of Bellingham does by keeping it's lighted stars up in the downtown till around February. Why not have showy lights for safety? There are cyclists who go through the trouble of welding together those high bikes, you know with the seat and handlebars way up off the ground. That's good for special events like parades, but why not something showy to enhance bike safety? I used a product called Spoke Brites. A pack of three sold for $9.95. Colored light emitting diodes that are powered with button batteries. Motion switches turn them on when the wheel is turning; especially if there are bumps in the pavement. 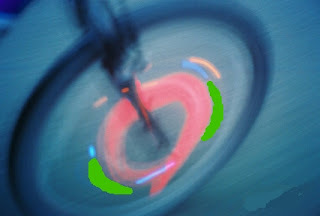 Problem is, they don't turn off for daytime riding, unless one removes them from spokes. This isn't a big problem in our long periods of winter dark and the batteries last a long time. Spoke Brites don't seem to be available in the local bike shop I checked. Lance Armstrong must have not used them. I found some in a Fred Myers on Bakerview Road. It's one of those big box stores that has variety. There are some other glowing LED products designed for wheel spokes. One friend has them in his wheels, but I am not sure where he got them. Some kind of mail order place. I also retrofitted another type of light that can be more easily found in bike shops. Two LED blinkers that people normally wear on clothing, or place on the back of the bike. I used clear plastic tape to stick these in among the spokes for red lights that move with the wheels. They have switches. If you are trying this, make sure to mount them so they don't catch on the frame or brakes as they go around. So far, no one has stolen them. They look kind of tacky in their wads of tape, when turned off. I get a lot of comments as I ride. Picture may have not turned out as good as they look in motion. lovely bicycle，I think so and happy new year.